On 4 June, Poland marked the 25th anniversary of the first partially free elections which helped bring down the Berlin Wall five months later. This has been an occasion for celebration, but also for reflection about achievements and missed opportunities. 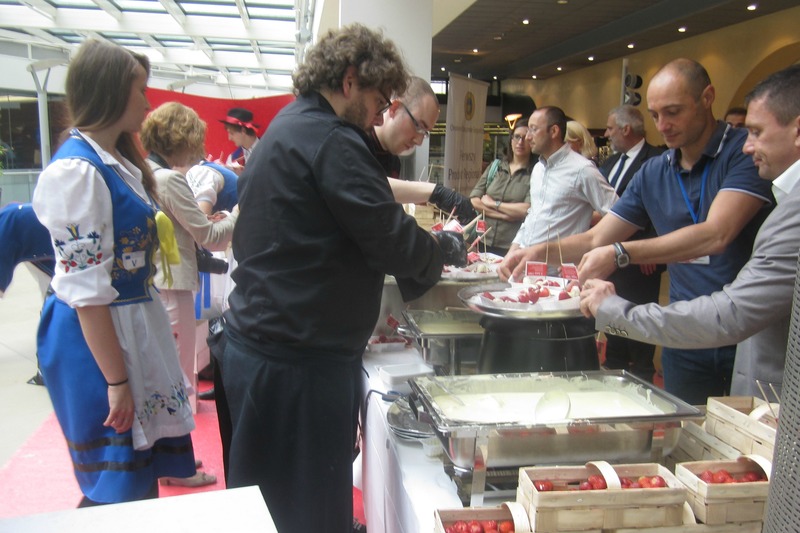 In the EU institutions, Poland commemorated the elections by treated invited guests to delicious Polish strawberries, brought from Kashubia, with white Belgian chocolate – symbolising the Polish flag. In Poland, the celebrations were marked, but also overshadowed, by the presence of US President Barack Obama, who visited Warsaw on his way to Brussels for the G7 summit. The elections on 4 May 1989 were held against the background of a massive wave of workers’ strikes which shook the communist regime so that it agreed to hold partially free elections. The poll was fully free for the Senate and not fully free for the Sejm, the lower chamber of parliament. However, the result of those elections was an overwhelming victory for Solidarno?? (Solidarity) and the opposition of the time. The results were a political earthquake. Solidarno?? won 99 of the 100 Senate seats and all out of the possible seats in the Sejm (161, with 173 for the communists). The Sejm voted for the communist party secretary General Wojciech Jaruzelski to become the president, but his candidature passed by only one vote. With no choice but to appoint a Solidarity member as prime minister, on August 24 Jaruzelski appointed Solidarno?? activist, Tadeusz Mazowiecki as head of a Solidarity-led coalition, ushering in a brief period described as “Your president, our prime minister”. Jaruzelski, who sent tanks to crush Solidarno? ?’s stirrings of democracy in 1981 passed away on 25 May, at the age of 90. At international level, the election is seen as one of the major milestones in the fall of communism in Central and Eastern Europe. One of the key figures was Solidarno? ?’s leader Lech Wa? ?sa, Nobel peace prize laureate, who became president one year later. But today Wa? ?sa says he wishes that more could have been achieved; a more effective state, equal opportunity and welfare for all, greater success in bringing he communists to account. “When I see how much we have spoiled, how careless we were, how much injustice we have caused, then I am displeased,” Wa? ?sa told Associated Press. Polish dissident and journalist Adam Michnik, another emblematic figure at the time, said that the social cost of the reforms were very high. But while lamenting the difficulties, he stressed that the achievements were far greater. Polish Ambassador to Belgium, Artur Harazim, told EURACTIV that the preparations for the elections gave Solidarno?? and the opposition the chance of exposure in the official media, although with limited time, and that the campaign had a face: Lech Wa??sa. “So we believe it started in Poland,” Harazim said, referring to the events that led to the collapse of the Berlin Wall and the fall of communist regimes in Central and Eastern Europe. Asked if Poles were still optimistic after having joined NATO 15 years ago and the EU ten years ago, the Polish diplomat said that his country was “probably an exception in Europe,” as there is a strong majority of Poles who strongly back European integration. “There are about 80% of Polish people supportive of their country being in the EU and that European integration should continue. Being still a new member, we see and we feel the positive results of EU integration,” Harazim said. Poland’s envoy said that in spite of a difficult transition and painful reforms, his compatriots could travel freely for study or work. He said there were about 50,000 Polish nationals who live in Belgium and are registered with Belgian municipalities. Also, about 8,000 small businesses are registered by Polish nationals in Belgium, mostly in the construction sector, but also in restaurants and small shops. The Guardian: How free is Poland?